“West End Woods” is a convenient name for a portion (about 50 acres) of a larger woodland which is privately owned and located in the western quarter of Cayman Brac. The owners are currently quarrying aggregate further west under permit from the Brac Development Control Board. This strip (600 feet in width, about a mile in length) can be reserved as a buffer. The 600 foot width is measured west from Saltwater Pond Trail, a traditional walking path running north to south, from the north bluff edge of Cayman Brac near the Texaco station (vicinity of White Bay Road) to Rebecca’s Cave in the south. In fact the trail could be said to go further than this, all the way to the sea in the south, but the last part has been changed to a vehicular road. The trail is over 100 years old and carried one family to relative safety in the ‘32 Storm, the tragic hurricane that killed over 100 Caymanians, mostly on Cayman Brac. Grim reminders are the Mass Grave on White Bay Road, and Rebecca’s Cave itself, renamed after the event for the baby who succumbed to exposure. Other notable sites in the immediate area are The Splits, a 17 acre land and fresh water preserve owned by the National Trust, and Trust House on White Bay Road. WHY THE INTEREST IN THIS WOODS? The significance of a buffer zone is recognised not only by Scott Development Ltd., the owners of the land and the quarry, and the National Trust, but also by the Brac’s Development Control Board. Not yet surveyed, the exact boundaries are not known. 50 acres is a crude estimate. But it is felt this forest will help preserve the ancient forest ecology in this part of the island, and preserve the natural values that have always been a part of living on Cayman Brac. The nature of this woods is known to very few people living today. Back in the days of boat and ship building, and when houses were built from local materials, people would have had regular recourse to this woods. This era ended around the 1950s. Therefore it was felt useful at this time to find out what trees, plants, land forms and creatures make up the forest which we have labelled West End Woods. HOW WAS THE WOODS INVESTIGATED? The method chosen was to cut three “slim cut lines” each of 600 foot length, running approximately East-West, i.e. at right angles to Saltwater Pond Trail. A contract permitting such access was signed by both the company and the National Trust. The exploration has now been done. Two cut lines were made fairly close to the trail’s extremities — one about a thousand feet in from the north end, one a similar distance from the south — and one was cut in the middle where the trail makes a “dogleg”. Each was cut as straight as possible given the rough terrain, and flagged with surveyor’s ribbon. The locations are recorded in the field notes but the cut lines are designed to revert to nature very quickly, and even now would be missed by a casual hiker on the main trail. 600 feet was measured by a fishing line, and one cut line was tested by a friend with a GPS. Five forays into the bush (4 hours per outing) served to cut the lines and to observe and note observations, particularly tree species and land forms. There are several limitations to the methodology. 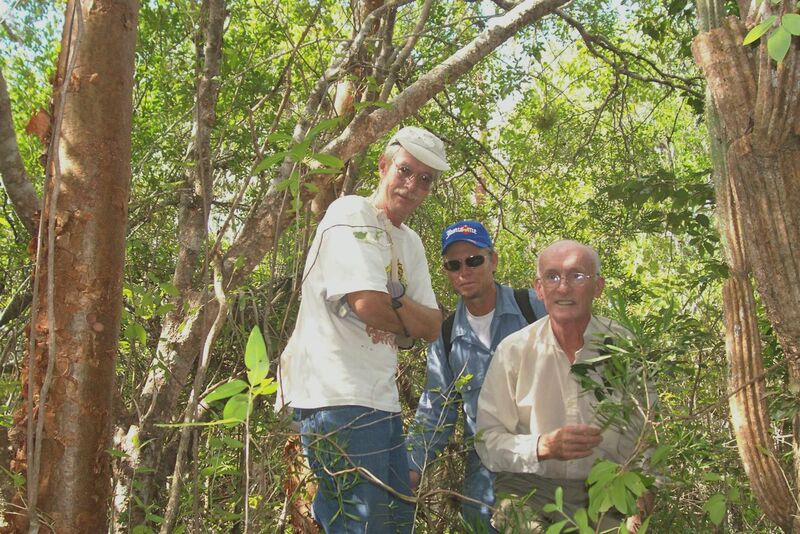 The team members possess good but not expert knowledge of the Brac bush. We did our work from 8 AM to noon in springtime, so missed night – time sightings and phenomena from other seasons. And we only inspected about 1% of the terrain, assuming we could see 10 feet on either side of our slim cut lines. We did a fast survey (if you could call it that, given the rough terrain) overlooking small creatures and features. The present report is based on the detailed field notes sketched during each day’s outing, and typed the same day. These are available to serious students on request. The members of the investigative team are listed at the end of this report. Land forms: West End Woods is a good example of the dry, deciduous woodlands that form in the karst formation atop the Bluff Plateau on Cayman Brac, Cayman Islands. The limestone base is heavily exposed in areas close to Saltwater Pond Trail, but is partly covered by leaf litter and patches of “red mould” further away from the trail. This reveals the extent to which the pioneers used the old trail to fetch firewood and specialty trees and plants for medicinal, building and other purposes. Rises and falls in the limestone surface were notable for us because we were trying to walk in a straight line. Sometimes one member of the team would be standing 15 feet above the others, and that’s not counting caves and sinkholes. 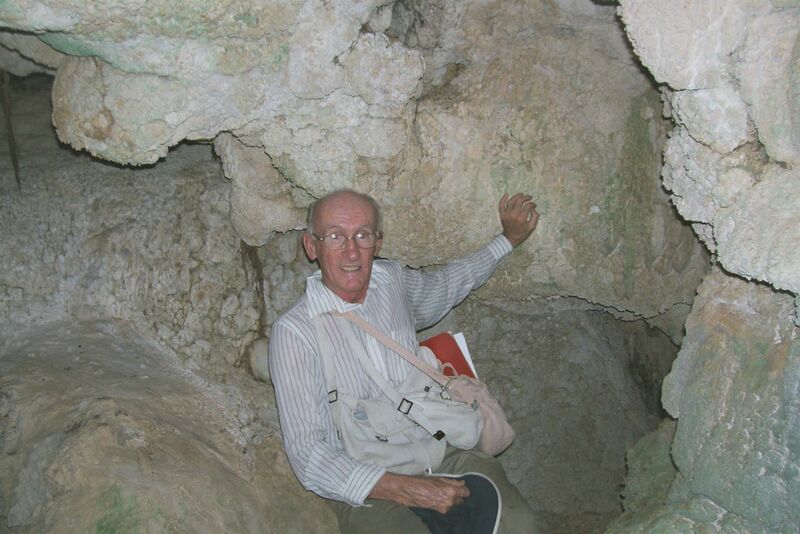 Several caves were found, as well as collapsed caves and ancient stream beds. In all, we saw more than six caves of a size that would tempt one to squat down inside to see if there was an underground tunnel. One cave will be described a bit later on in this report. 300 ‘ approx. : Sinkhole — a flat-bottomed sinkhole with lots of old rock, branches and soil in the bottom, making a productive valley with the above trees plus Candlewood both old and new, washwood, fiddlewood, Whitewood, Pompero. 325’ approx. Sinkhole! 10 foot diameter but 30 foot deep, and recessed bottom suggesting there may be caves hidden down there. Huge balsam (Clusia regia) growing out of it. Running Clusia also, Washwood, Cabbage Tree, Spanish Elm, many air plants. 350’ approx. Plumeria, pickle wood, Whitewood and another cave. “We walked through “Clusia Alley” and it was very tough going. Cantrell’s name for it is Balsam vine which is quite appropriate for the recumbent type of Clusia. Then we came to “Bromeliad Heaven” about 450 feet in, or perhaps 500. It’s located in one of these collapsed streambeds, this one with a pretty good hole housing a large Washwood tree. (We’re not sure which of the Washwoods; at first I mistook it for a Pompero.) It and adjacent trees are festooned with several Tillandsia species from the smallest to one much larger than one’s arms could encircle. They’re spotted all the way from ground level to 15 feet up a tree. Other plants nearby are Phyllanthus, large cactus, Candlewood, Pepper Cinnamon and a Fig tree. We saw many birds at this point! The most exciting is one we couldn’t name — yellow with a grey back, larger than an Elaenia, and with a somewhat thick bill which was much longer than the Thick-billed Vireo. The birds we recognised and pulled in by “pishing” included Bananaquit, Vitelline Warbler, Zenaida Dove (it stayed by us for a time), and Caribbean Elaenia. The team unanimously recommends saving this woodland, more if possible, for posterity. It is a rich, diverse, healthy native forest, almost unspoiled. It has never been clear-cut. The area is important as a natural site in the western part of the island, kept intact up to now by private ownership and by the very rough terrain. The historical importance of West End Woods lies primarily in the old-time use of Saltwater Pond Trail connecting the two coasts of Cayman Brac. But it is also obvious that the trail led to the valuable traditional trees that sustained pioneer life here. The woods (as well as the sea) served as a source of everything needed to sustain pioneer life — firewood; wood to keep fire overnight (candlewood); to keep away mosquitoes (smokewood); for oars and masts (Spanish elm); knees and other boat-building uses (pompero and several others); wattles for the earliest houses (cabbage tree and others); house posts (ironwood, mahogany, bitter plum); tool handles (bull hoof); soap (washwood); and medicines of all kinds (bush teas, poultices, even one to stop bleeding from a cut (pepper cinnamon). All of these trees are to be found in West End Woods. The location of this woods in West End will give that area a native stand just as the Parrot Reserve provides the central island. Ultimately, one quarter of Cayman Brac should be protected, representing all the main features, and this forest can represent one small contribution. The rapid pace of forest destruction makes this protection urgent. Quarrying is not the worst threat to our forests, only the most terminal. Slash-and-burn agriculture, road building, and lot clearing for residential and commercial use are the other daily enemies. The smell of cleared and burning bush (open burning is as common here as in Madagascar) is a steady stench, especially in winter. The surge of post-Hurricane Ivan buying and building on the bluff plateau is alarming. 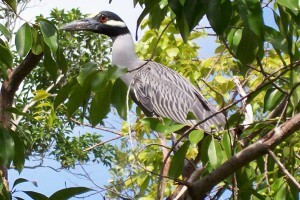 Having rejected zoning, or even a plan, the only thing left for Cayman Brac is to acquire and set aside natural areas. The final reason for protecting this forest is to maintain the mystery. 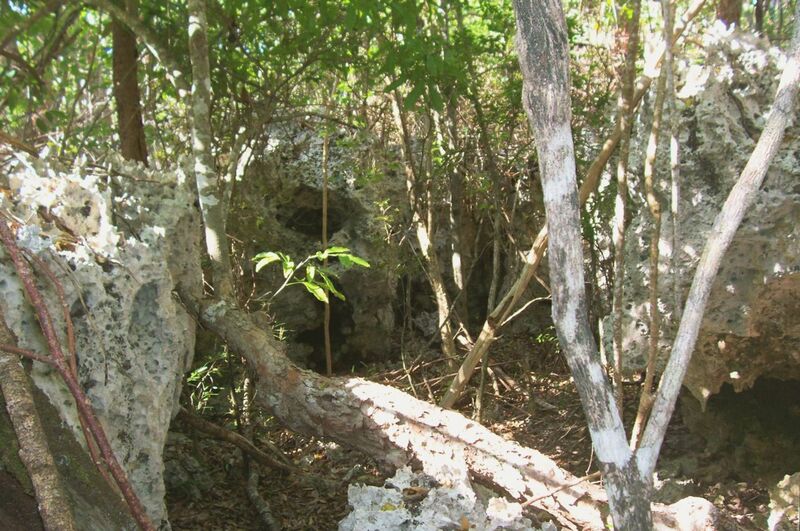 People need a soul and a great part of the soul of Cayman Brac has been its deep forests. It has been our hinterland. As little as 10 years ago this was a predominantly green island, and the green was our native forest. Now Cayman Brac is developing into just another town, with a grid of streets, boring rectangles, from one end to the other. There are six parallel streets in the one-mile width of Cayman Brac, for example, at Stake Bay. How will children imagine duppies and rolling calves in such an end-to-end town? What will happen to the pharmacopeia of old? Where is the allure, the romance, the spirit of old? Where is the soul of Cayman Brac? Mystery must be maintained. 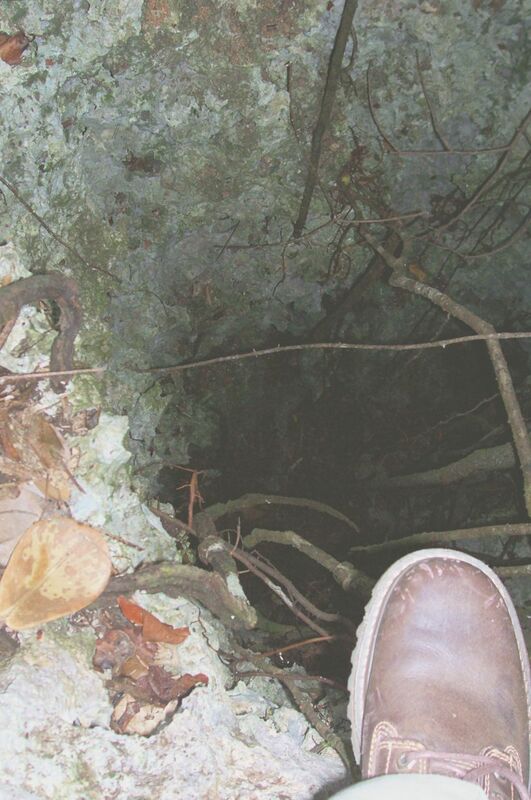 Is there a cave at the bottom of the 30 foot sinkhole? The answer is best left a mystery. West End Woods should be surveyed. If funds are not available, the three points at 600 foot distance could be connected by a cutline — an informal survey. Permanent legal protection for “West End Woods” should be achieved now while the stakeholders agree and while political will is strong. This transfer of land probably does not require a formal survey. Saltwater Pond Trail itself should become a boardwalk. At the moment it is an open invitation to a broken leg — the state of the trail is abominable, except for a few hundred feet at each end. This is nobody’s fault — it is not simply overgrown. The fact is that limestone paths do not wear smooth with the passage of time, they wear rough, into spikes and holes and sharp edges. Differential erosion leaves needle-like projections, so that the trail is more impassible now than it was in 1932 or even in the 1950s. Human footwear has a smoothing effect but the trail has fallen into disuse, and differential erosion has taken its toll. A very short management plan for the 50 acre buffer zone should be approved, allowing no access and no trails, other than Saltwater Pond Trail. Even scientists should not be allowed except under low-impact rules and one-time permits. The problem with trails and open access is that DAMAGING PESTS FOLLOW and bring the diseases of civilisation. A very bad example exists on Saltwater Pond Trail itself — one of the best caves is infested with fleas! It’s a feral animal place. Cats, rats and dogs follow the paths of least resistance, whether these are roads or walking paths. The latest challenge is chickens. Fowl disturb the ground wherever they range and they are now invading the bluff plateau up and down the north side. Since there is an extremely low level of public pressure or political will to eliminate or even curb these pests, we must rely on the severe terrain to keep them out of the deep bush. Karst limestone formation is a godsend in these circumstances, although it’s difficult for iguanas too. If further investigation of West End Woods is desired by the parties to the present contract, the team stands ready. The author is responsible for the validity of the facts and opinions presented in this report.